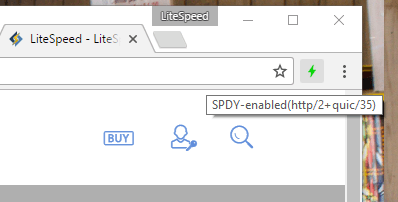 There’s a Chrome extension which will allow you to see the protocols at work on your favorite websites: HTTP/2 and SPDY indicator by rauchg. Install it, and keep an eye on the little lightning bolt in the Chrome toolbar. Blue indicates HTTP/2 is enabled. Green indicates HTTP/2 + QUIC. And if you hover your cursor over the lightning bolt, you can see a list of enabled protocols for yourself. This particular screenshot was captured from our own website. As you can see, we are QUIC-powered! The Google-developed QUIC (Quick UDP Internet Connections) protocol is the next-generation web protocol. It takes a new approach to reducing latency by addressing the problems of packet loss and long RTT’s (Round Trip Times). It manages the former through the use of UDP (User Datagram Protocol) vs. the ubiquitous TCP, and then deals with the latter by minimizing the number of round trips between sender and receiver. The IETF is currently working on a set of standards, but in the meantime you can learn more about QUIC via Wikipedia. QUIC is new, and while support has been widely-adopted among Google’s own services, you’re not likely to find it in use much outside of Google space. Until now, that is! QUIC support will be forthcoming in LiteSpeed WebADC 2.1, with LiteSpeed Web Server support to follow. If you’ve got a non-mission-critical server to play with, you can download the WebADC release candidate and give QUIC a try right now! We’re pretty motivated to see what we can do with this new protocol, and we will have some exciting QUIC product releases soon. Enjoy the next biggest thing of the World Wide Web, today, with LiteSpeed! Stay tuned for some benchmarks comparing our QUIC solutions to other implementations out there!